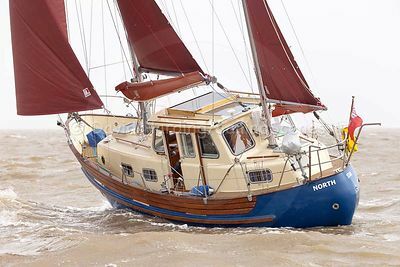 If someone were to ask ‘what were you doing last Saturday?’, we would answer that we were on the easternmost fringes of Essex, short-tacking a heavy, long-keeled, ketch-rigged motor-sailer across an increasingly narrow and muddy channel in 20 knots of wind. Why? There was a reason. And on Wednesday? Blasting around in (and outside) Chichester Harbour at anything up to 16 knots on six hulls. Six hulls? Has someone invented a sextamaran? 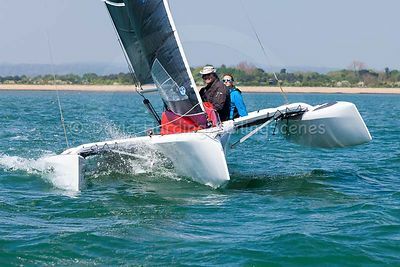 They may have, but in this case it was two times three – a couple of trimarans in other words, plus a RIB as a transfer boat for the multiple hops between the two sets of hulls. Wearing our-boat-testing and Sail Clinic hats for Practical Boat Owner we get involved in a variety of missions, and they don’t get much more contrasting than these two. What they had in common is that both involved a fairly high degree of physical exertion following the planning necessary to make them happen in the first place. 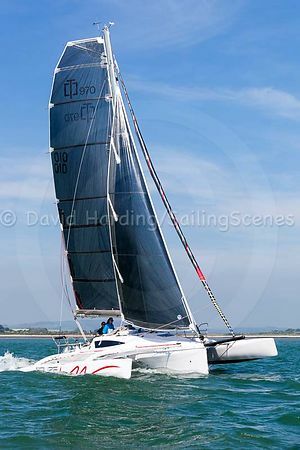 For example, motor-sailers like the one on the east coast are most definitely not conceived with short tacking in mind: going about is what you might call a deliberate process, involving much winching of a large headsail that first has to negotiate a lot of rigging. And it’s not as though the boat was designed with efficient winching in mind either, so sheeting home takes a long time. Our mission was to make the boat less reluctant to tack, and there were only two of us on board. So we had to work out a tacking strategy and then photograph the process before moving rapidly into winching position to complete the tack and bring the boat up to speed ready for the next one. 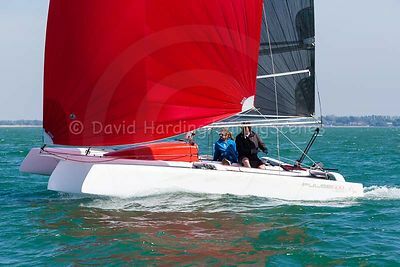 Short-tacking can be hard work during a regatta on a racing yacht, but racing yachts are designed for that sort of thing, you usually have more crew and you don’t have to photograph the action at the same time. On this occasion the owner had to complete several tacks on his own as well, while I was taking some photographs from another boat, so he really had his work cut out. On this mission at least there were only two hops between boats – from test boat to photo boat and back again. 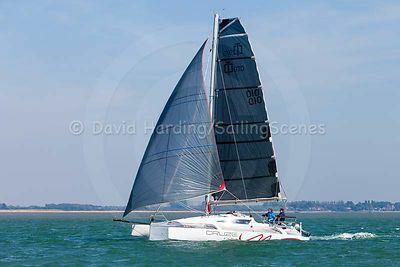 It was breezy and a bit lumpy but, with good boat-handling from both skippers, all was well. More transfers were involved with the trimaran tests: we started on the larger tri and took some shots of the smaller one before finding that shooting under sail in a narrowish channel with muddy banks (yes, another one of those) didn’t give us a chance get into the right position before someone had to tack. 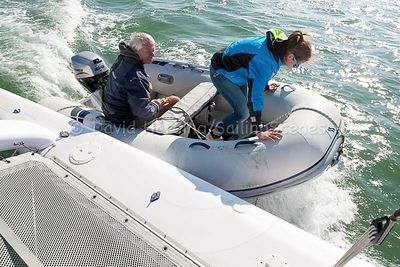 So we hopped into the baby RIB to take the rest of the pics, then aboard the smaller tri from which we took the photos of the bigger one. After that it was a pit-stop on the big tri to change cameras and jump back via the RIB on to the smaller one for the testing and on-board shots. With the small boat tested and photographed, we transferred to the big one again for the test-sailing and on-board photography. That's 14.6 knots of boat speed in 17 knots of apparent wind (slightly less in true wind). Not bad for a cruising trimaran sailed in a leisurely manner by a crew of two. 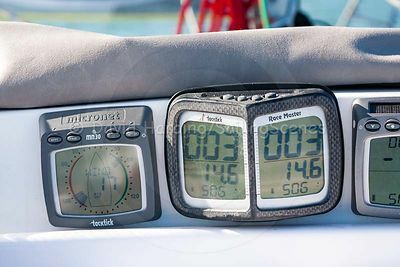 If you have skippers and RIB drivers who know what they’re doing, you can hop from RIB to trimaran or vice versa in flattish water even in 15 knots of breeze with the boats sailing along at a fair lick: you simply don’t have time to park up whenever a transfer is needed. Testing and photographing two boats in a day can be a pretty full-on operation if you’re going to do them both justice, but when the dealer has everything and everyone lined up and organised it’s do-able. Even so, we didn’t finish until about 8:30 in the evening. It's work – but it beats a day in the office. 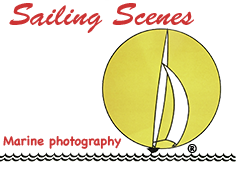 You can read the test of the trimarans in the Summer 2017 issue of PBO.